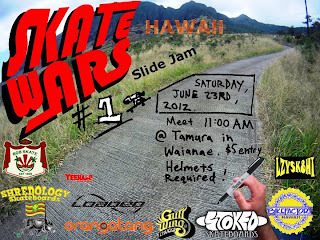 The first ever Skate Wars Hawaii went down last weekend in the heart of Westside Oahu. This slide jam was a little different, with a new format to decide on the winners. All of the competitors were able to vote on winners for different categories, including Best All-Kine Overall, Best Style, Most Creative, Most Determined / Most Nuts Charger, and Worst Lickings / Most Bloody. There was plenty of excitement and curiosity leading up to the event, as many skaters had never been to this hill. Hidden away, DEEP in a valley on the gnarly westside in a "neighborhood" filled with makeshift shacks, deserted cars, piles of old tires, and stray dogs is a steep and narrow closed-traffic service road. After the initial meetup at Tamura, we headed for the hill. The sketchy path didn't deter anyone, as everyone proceeded to get nuts and style out the half-ribbed-concrete / half-asphalt war-zone. 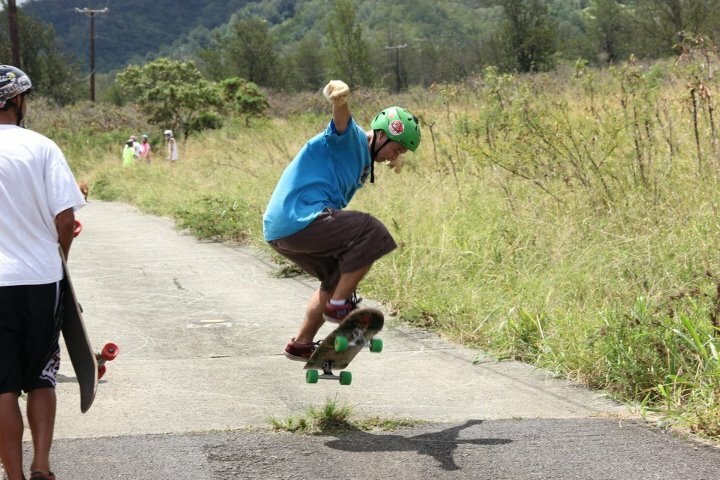 The first part of the jam was ran without heats or time limits, as skaters sessioned an eighth mile section with a few turns and a speed bump. Competition was fierce in the all-out every-man-for-himself battle. 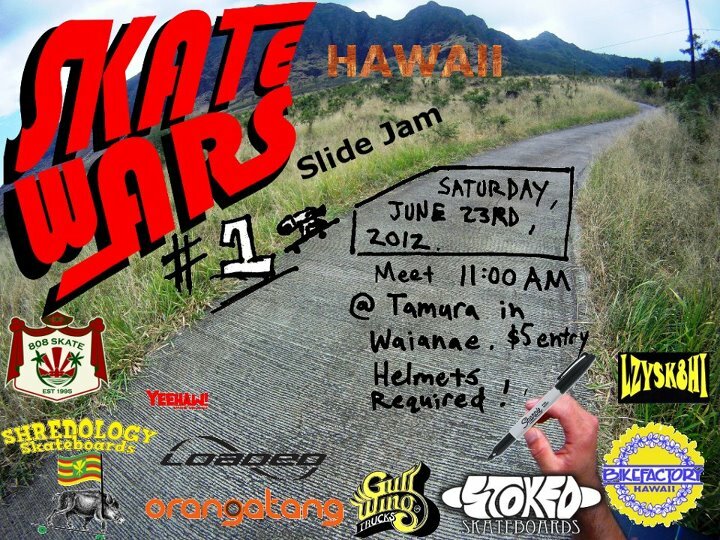 Skaters from all over the island came out to skate, with the youngest being 14 and Darryl being the oldest (although he doesn't age cause he is a straight-up god). Many different styles and techniques were displayed, with skaters pulling some switch powerslides, shuvit slides, edge-of-road boardslides, hands-down 360s, or just huge frontside and backside slides in the asphalt butter-zone at the end of the run. After this portion of the jam, a game of slide kick-the-can was played. The point was to throw a powerslide at a chalk line and hold it out until you slid into a cone. The cone was moved back 5 feet each round and if you didn't stick your slide into the cone and ride away clean then you were out. The sketchiest part of kick-the-can was that slides had to be thrown right after the road transitioned from concrete to asphalt. This was to ensure that we made use of the straightest part of the course. Finally, after all the hard shredding and some dirty lickings, it was time to crown the victors of Skate Wars. We migrated out of the blazing sun to the nearby jack-in-the-crack, fueled up on musubis, and counted up the votes. When the dust settled and the crowd had spoken, the victorious were crowned. 5. Most Determined / Most Nuts Charger: Brandon "Crab"
6. Worst Lickings / Most Bloody: Tommy "Cookie"
All of the sponsors hooked it up fat, with choke prizes for everyone. Just about everyone left with something. After prizes we headed across the street to the beach for more grindz and an ocean sesh. Overall, the day was filled with good times and positive vibes. Thank you to all of the sponsors, Lisa & Jackie for making some ono kine grindz, and everyone who came out to skate and support. Be on the lookout for Skate Wars II. K den. 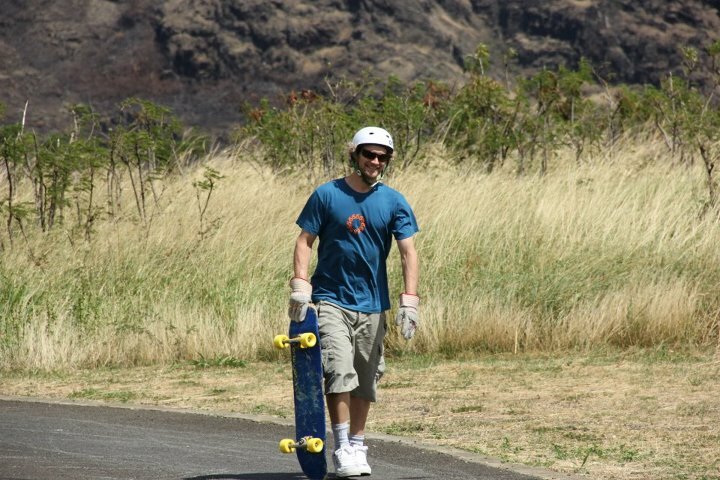 Skateboarders love Hawaii, and we love to host skateboarders. Hawaii's been getting TONS of awesome exposure recently and we couldn't be more stoked. Keep on coming to the islands... the good times and great vibes are guaranteed! 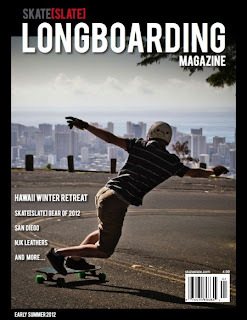 Hawaiian Slide Session from SkateHouseMedia.com on Vimeo. Caliber In Hawaii from SkateHouseMedia.com on Vimeo.